Chandigarh Management Association (CMA) organized an outreach program and a session on ‘Managing Emotional and Social Quotient’ on January 17, 2018 at the Government Rehabilitation Institute of Intellectual Disabilities (GRIID), Sector 31 C, Chandigarh. A total of 60 participants attended the event including the GRIID Faculty and CMA Members. 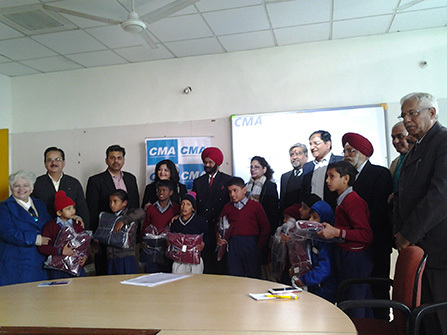 As part of CMA’s social responsibility, President CMA Mr. Deepak Dhingra alongwith the executive committee members and Dr. (Mrs.) Vani Ratnam, Officer Incharge, GRIID, distributed winter uniforms to 48 needy students of the GRIID at the begining of the session. Mrs. Abha Chaudhary, President IMPA, Chandigarh Chapter, was the expert speaker on the topic. She is an accomplished professional and entrepreneur with three decades of diverse experience in coaching and consultative roles and is a certified practitioner of Neuro Linguistic Programming (NLP). Emotional Agility, Anger Management, Emotional Resilience, Self Esteem, Self-Efficacy, Social Intelligence – the people friendly mantra and Social Wellness are the areas she touched upon for the audience – who were the faculty of GRIID and CMA members. Mrs. Abha conducted the tapping technique with the audience followed by a question answer session.